I've got a short post-christmas blog post today. I figure lousy of you are off enjoying family and presents and too busy to read my boring blog! So I've managed to avoid having to buy to many models for Frostgrave, and that is one of the things I like about the game--I already have everything I need. But when the Forgotten Pacts Nickstarter was started I couldn't help but sign up for the Plastic Barbarians. At this point, anyone who's interested in them has seen the sprues already, so I won't bore people with pictures of that. My verdict is that these models are great. The scale is perfect, they aren't mammoth like GW stuff, but they have enough exaggeration that they are easy to paint in a way that true 25mm models can lack. 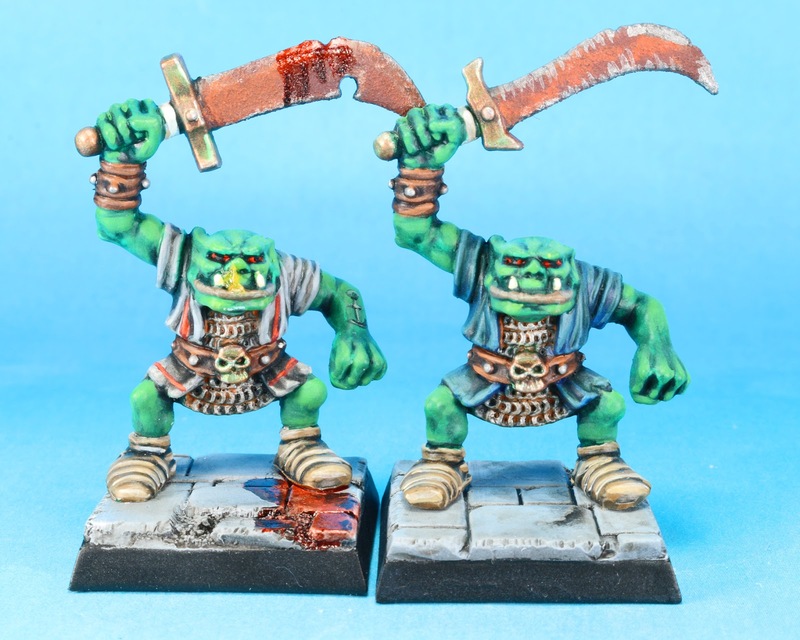 This is especially true with the eyes; I find true 25mm models have impossible to paint eyes! I've also read a lot of people that say that the official Frostgrave models don't scale well with heroic scale models. But, at least with the barbarians, I don't find this to be true at all. I thought they fit in quite well. A tad bit smaller, but nothing that makes them stick out. I think the aforementioned exaggerations help a lot with that. The aesthetics of the barbarians are one of my favorite part of the models, they look like barbarians, but not like cartoons. That's the problem I have with the plastic Chaos Marauders, they look like professional wrestler characters, not actual barbarians. Sure, these models probably would be out of place in a historical game as they don't appear to be patterned after any particular historical peoples. But whomever they're modeled after, these guys look weathered and hard lived. I was pretty amazed at how much character and expression they have in their faces. You can tell they've lived hard lives and those hardships have etched their faces. It's not just their faces that are well sculpted, most everything is. These models look like they're wearing clothes that have been repaired, scavenged, and make-shift. The weapons are menacing. The posing of the bodies is excellent. There is only one problem I found with the sculpting: the fur. The fur is very shallow. And that made it difficult to paint. But now that I know to expect that, I can compensate when I paint more. As far as the sprues are concerned, these are great too. They come with tons of options including missle weapons, two-handed weapons, hand weapons, shields, and more heads than you can ever use. The only downside is that you get 4 of the same sprue of five bodies. But with all the options previously mentioned, that's not a bid deal. They also come off their integral bases really, really easily. I think it took less than a minute with my razor saw to remove them and with no damage to the shoes. However, I did find one problem with the sprue as well. As can be seen in the picture below, the weapons that require both hands were very difficult to line up right. I've gotten used to the recent Games Workshop plastics, where many of these types of arms are a single piece with both arms attached to the weapon and they slide perfectly on. As you can see below, the bottom of the axe haft isn't really in his left hand--it just kind of sits below his hand. 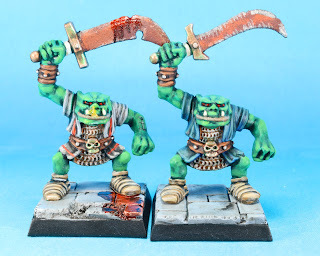 That said, those were the only two things I didn't like about these models. They are excellent. 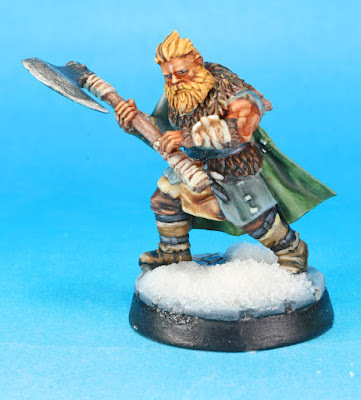 I know if I wanted to do an Oldhammer Norse army, I would uses these as my basis. But enough rambling, It's time for a quick picture. 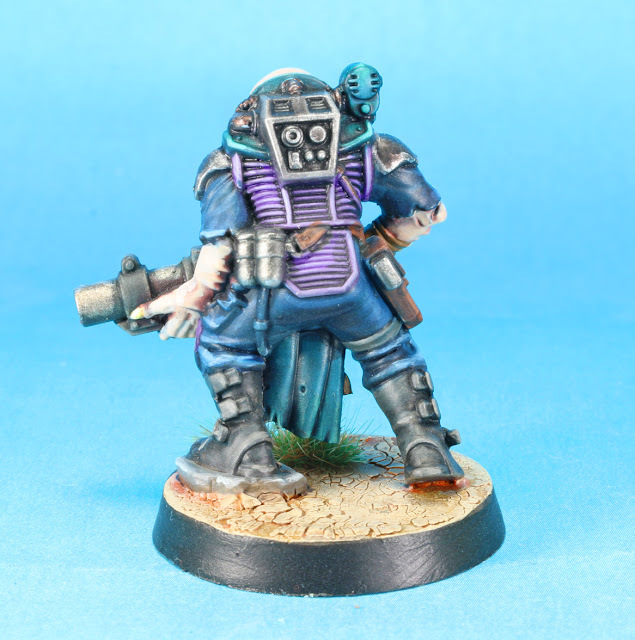 I do want to apologize for the paint job below, I'm not particularly proud of it, or even happy with it. I was trying to get the model done quickly and it was time to replace my brush but I wanted to get just a little more out of it. As such, the tip wasn't as fine as it should have been and a lot of the model looks spotchy and dirty almost as if parts had been drybrushed. And now for the Zombie I mentioned in the title. 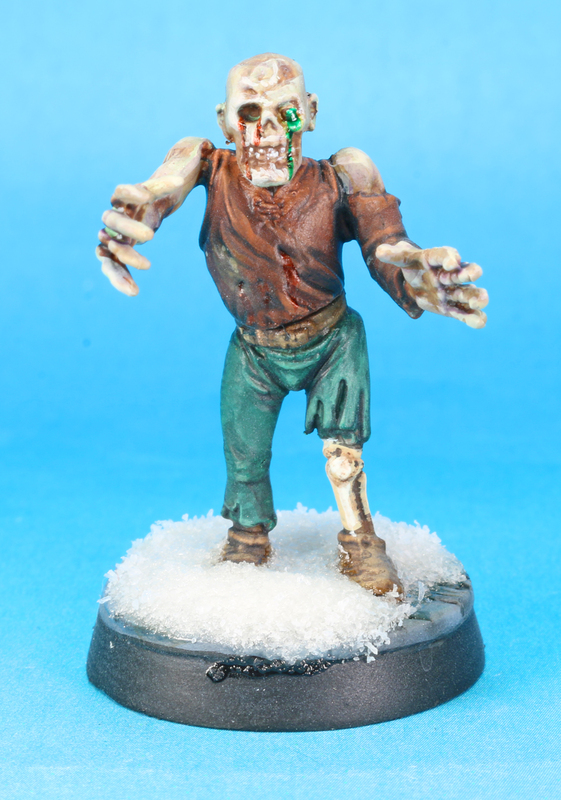 Way back on my old warseer thread, I posted a picture of my Frostgrave warband with a zombie that had no snow on its base as I had forgotten to base him with the rest of the warband. Well no longer! He is now fully based! Back in November, I pledged for the Rogue Stars Nickstarter. It seemed like a game I'd enjoy; it's a Science Fiction skirmish games, about 5 models per side, and it's largely setting agnostic. Plus, Mark Copplestone sculpted the models (or at least most of them). Why not try it? My thought was I could apply a reasonably light weight set of rules to the Warhammer 40k background and play small games with my kids. The author, Andrea Sfiligoi, is known for doing some good rulesets. The Nickstarter closed on December 4, 2016. But since I live on another continent, I wasn't expecting it right away. In fact, I sort of forgot about it. Then, while riding the train home on Monday the 19th, I saw Whiskey Priest's review. It is not kind. I was scared. Did I waste my money? And as I arrived home, there was a box in my mailbox from Northstar. So I would have a chance to check it out for myself almost immediately after reading some negative things about it. To me, this seems like a roleplaying game, disguised as a skirmish game, but without any roleplaying. Make sense? Of course not. Let me try to explain. 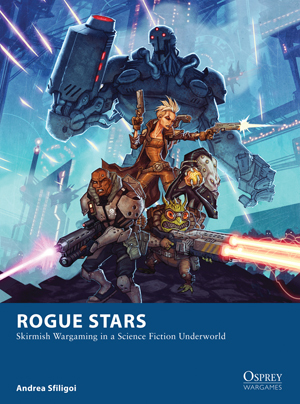 Rogue Stars is, ostensibly, a skirmish game for two players of up to 5 models each. Everything is based on a D20. Roll higher than a difficulty and you pass an action, roll lower and you fail the action. Pretty simple in concept. But, the game is reliant on "themes." When designing your squad, you pick a theme. That theme is very reminiscent of roleplaying. It's not picking an army or a race. If you want to play miners, for example, you can have a space orc, a space elf, a space dwarf, a space rat, and a human all working together. What's important is that they are miners, not who they fight for or what their species is. And this theme is used to help you tell the story of the mission. And the rules contain eight pages on setting up your mission (the book is only 64 pages, so that is one-eighth of the entire book). The rules clearly want you to have a story as those eight pages help you describe every aspect of the mission: what the purpose is, where it occurs, what the weather is like, etc. This, however, is where it loses the roleplaying. Almost all eight of those pages are charts. And much of the 56 other pages are also charts. And what little text there is is boring. Like really boring. There is no fun in the explanation. It's very clinical and sterile. It feels like you're reading a textbook, not a game that is supposed to be fun. Now, after complaining about all the charts (so many charts...), I don't think it is as bad as others have made it out. I suspect most of the charts are easily memorized after a few games as they seem largely to be specialized rules. For example, many relate to he effects of weapons or armor. Once you've modeled your squad, you will largely use the same weapons and same armor. I think this will hold true for the special actions as well--most players will likely find they are shooting at the same range most of the time or attempting the same combat moves based on their weapons most of the time. I also really like it's initiative system. Basically the starting player keeps going until he or she wants to let the other player have a turn. Now, there are plenty of reasons to do this. Each action accumulates stress, which makes it harder to do more actions. And failing an attempt at an action gives the opponent free actions that occur first. But passing the initiative removes all the stress from your models. I think this is an interesting take on the I Go-You Go system. In addition, I think it was nice that the weapons and armor rules cover almost every thing from classic science fiction games and stories. 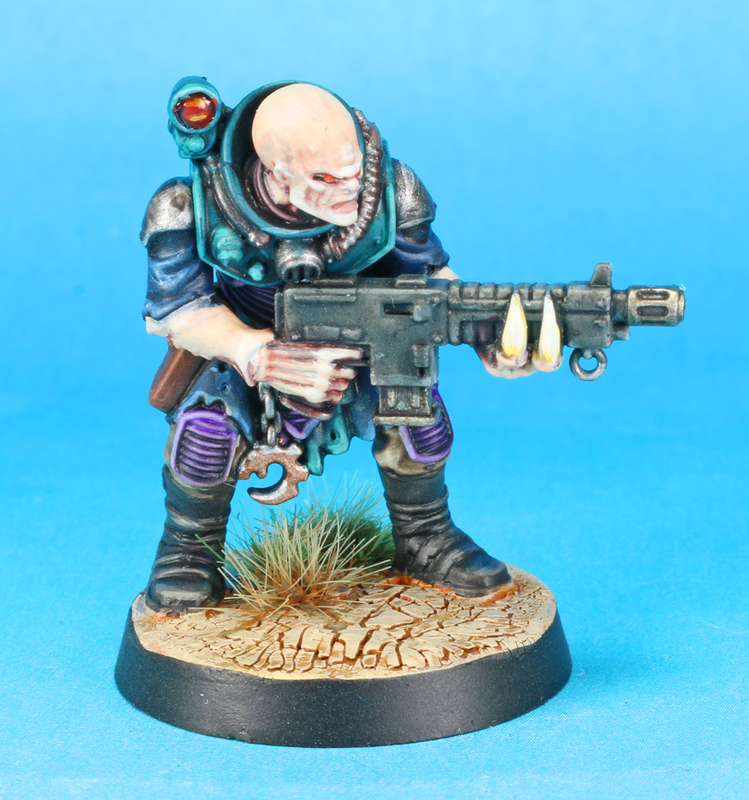 Except the Space Marine's trusty bolter. I can't figure out what to classify that as. Molecular Slugthrower, maybe? But, to circle back around, this is where the presentation hurts the game. All those charts I mentioned? They're actually pretty simple. They just list modifiers to your difficulty rolls. And most of them do not stack. For example, a called shot to the head has one difficulty modifier while a rapid fire burst has another. Clearly, you're not doing both at once. The only place where they stack is either range based modifiers or modifiers from different charts. So a long range called shot to the head with a primitive needle gun would have several modifiers from several charts. But those would 1) likely be few and far between and 2) easy to skip while learning the rules. So these charts look far more imposing than they really are. All this said, there is one thing I really, really, really do not like about Rogue Stars. You have to keep track of hit locations. I hate that in wargames. It adds unnecessary complexity and book keeping. My seven year old isn't going to be able to keep track of which mercenary has lost the use of his right arm and which has lost their left leg. 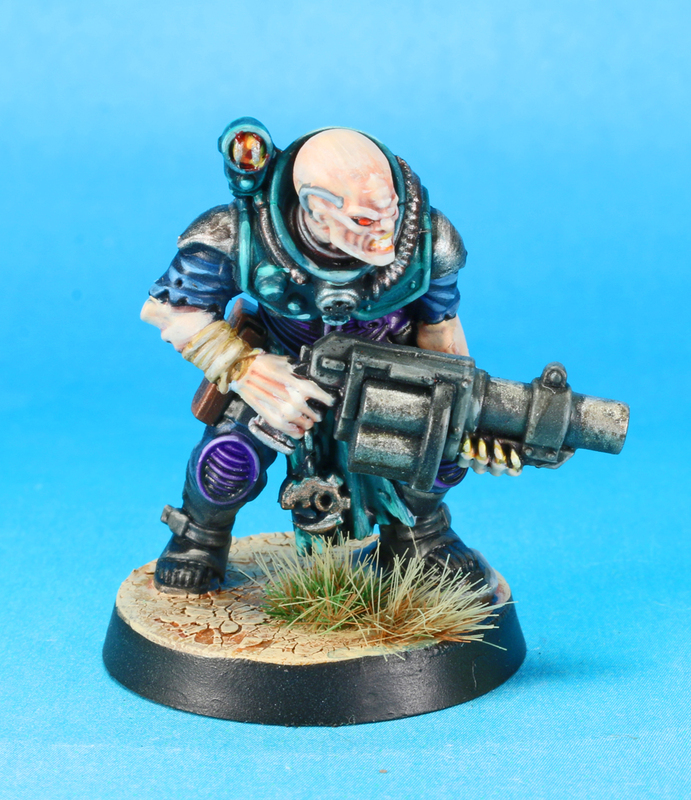 He just wants to know if his guys are dead yet or if they can shoot now. So I originally wrote this review and finished with a recommendation against picking this game up unless you like lots of bookkeeping. But then I slept on it. After thinking some more about it, I don't know that I still agree with my original conclusion. I don't think this game is any more complicated than, say, (the original) Confrontation...it is just presented in a way that makes it look that way. I think it's not a bad system. And limited to 4-6 models per side, there isn't too much complexity to keep track of. The only house rule I'll add is dealing with hit locations. So all in all, I probably would recommend this game, at least to read. I painted this cultist at the same time as the other genestealer cultists. 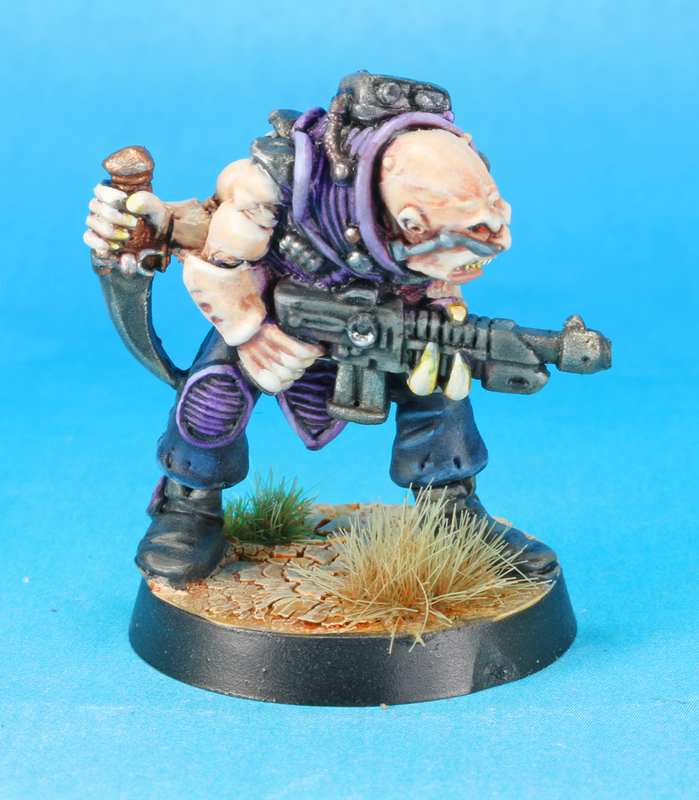 But being an oldhammer model, I felt he deserved his own blog post. He's not quite the same as the modern plastics either, since he lacks the jade chest piece, instead having the the segmented armor all over. He also has the oldhammer proportions that make these models so classic (and so much more fun to paint). Not much else to say, other than enjoy this excellent Jes Goodwin sculpt! "Soon," thought Ketnil. "Soon, we will bring enlightenment to the galactic outworld. These inbred hicks will know the bliss of our Patriarchs kiss and the wisdom of Magus Thy'rul'ak'l. But first, we must control the industry so they will be forced to listen!" 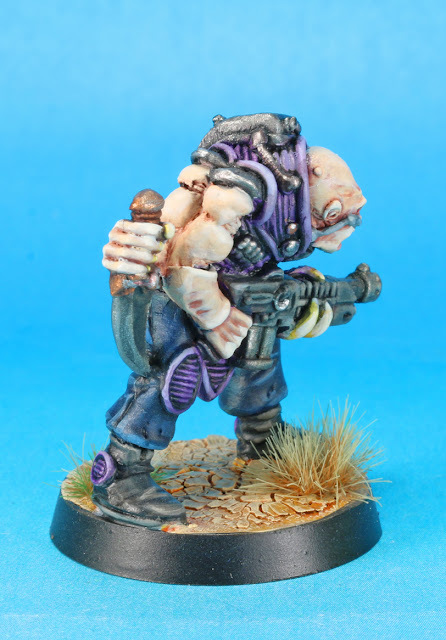 I'll admit I was bitten by the Genestealer cult bug. I've never been a fan of Tyranids and never really cared about purestrain genestealers. I also never really appreciated the old-school genestealer cults because I didn't get into 40k until well into second edition and missed their hay-day. 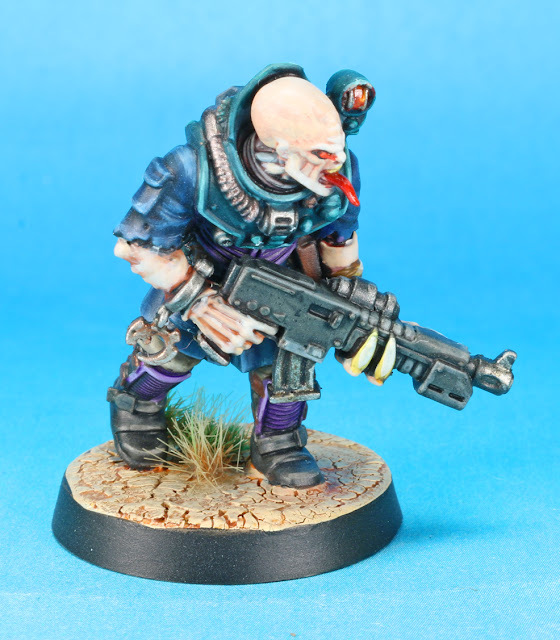 But when I saw the White Dwarf releasing the new genestealer cults, I was smitten. I was already planning on running out and buying a box of the new plastics, when I remembered I had picked up the Deathwatch Overkill box in a clearance sale a while back. Yay, I could feed my fix without having to spend money! When I said above that I never really cared about purestrain genestealers, that doesn't mean I don't have any. I have the set from Space Hulk painted (by Darkblade). So I attempted to copy the color schemes used there. The only differences I made is the purple plastic armor (since genestealers don't have armor) and I "humaned" up the flesh tones. I also began daydreaming about the background of the cult. I decided that they are a more religious based cult than a warrior based cult. I'm also a huge sucker for sea-green type colors right now. Thus, the Cult of the Jade Destroyer was born. I incorporated the jade into the chest armor as well. I also decided this cult is on a desert world, so the base reflects this, as well as I tired to give a dusty appearance. I don't think I got the dustiness as well as I could have, I think on the next batch, I may apply some Ammo of Mig Rainmarks as well. These giant photos always make you notice all the things you need to improve next time! Torendil crept slowly forward, "who knows what traps Zargon may have set," he though. He was acting as the point for his companions, a dwarf, a wizard, and a barbarian, because he had the keenest eyes and the fastest reflexes. If anyone could spot a trap it would be him. Suddenly, Torendil smelled a terrible stench of rotting meat and moldy wool. Then, he heard the sounds of boots on the stone. He quickly nocked his bow before shouting "Orcs!" HeroQuest is one of my all time favorite games. It's a classic dungeon crawler that puts the players in the shoes of some fairly simple archetypes: wizard, dwarf, elf, and barbarian. No real roleplaying necessary; just the fun of hacking down monsters and looting treasure. As I tell anyone who will listen, I've been working on painting all the figures from my original set. So far, I've finished all the monsters that would fit on 20mm square bases: goblins, zombies, skeletons, and mummies (but I'm probably going to redo the bases). 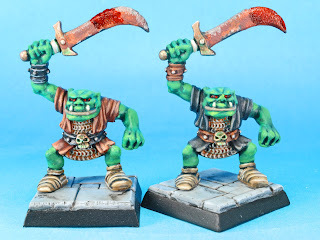 So when the guys over at Scale Creep asked me to paint a model for their HeroQuest Hero Quest, I obliged and chose an orc as I have eight of them to get painted and I can easily paint four in a batch. Since I was only painting one for Scale Creep, however, I decided to paint four to the same standard and then spend some additional time on one of them. The story of that one can be found here. The orcs were painted in the standard way I've painted the other few orcs since I started this blog, 50:50 Dark Angels green:Goblin green followed by a shade with Orc Flesh Wash, followed by the base coat, then a layer of Goblin green, and then mixing in Sunburst yellow for highlighting. The clothing was painted with various earthy shades and the leathers with various browns. I also painted the sword blades using pigments and buffable metallic paints. When they were finished, I mounted them on DragonForge Temple bases. For the record, I think these pictures came out better than the ones I used on Scale Creep!